This summer and autumn have been relatively quiet months for changes to the planning system, with several major events taking place which may have been a distraction! Planning fees are increasing on 1st November. See further details below. We discuss the recent and impending imposition of controls over matters which previously were not concerns of the planning system. High hedges, click HERE; payday lending and betting offices, click HERE; and hill tracks, click HERE. Planning fees will be increase again, by about 5%, from 1 November 2014. This is the third increase in planning fees since the start of the 2009 planning regime. Fees were increased by about ten per cent from 1 April 2010. Most recently fees were increased from 6 April 2013 by about 20 per cent. So from 1 November 2014 planning fees will have increased by over 35 per cent since March 2010.
the maximum full application fee goes up from £19,100 to £20,055. 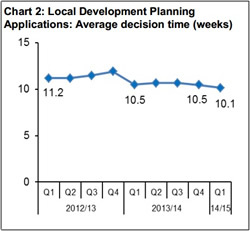 “The average decision time for the 7,855 local developments decided in quarter 1, 2014/15 was 10.1 weeks, the quickest average decision time over the past nine quarters and more than 2 days quicker than the previous quarter (10.5 weeks). There is a similar improvement of 2 days when compared to the equivalent quarter in 2013/14 (10.5 weeks) and when compared to the first quarter in 2012/13 (11.2 weeks) the improvement is over 1 week. 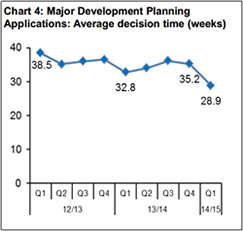 The average decision time for the 86 major developments decided in quarter 1, 2014/15 was 28.9 weeks, the quickest average decision time over the past nine quarters and more than 6 weeks quicker than the previous quarter (35.2 weeks). The downside of this is that the statutory determining times for “local” applications is 8 weeks, and for “major” is 16 weeks; so although an improvement, these averages are not even being reached for local applications – and are some way off being achieved for major applications : the very ones which are likely to be delivering jobs, investment and economic enhancement. Every so often issues arise which the great and good consider can best be dealt with by the poor, maligned planning system! There has been a rush of these this year, starting with high hedges – particularly unusual because the planning system has never before controlled what people can grow – only what they can cut down. The High Hedges (Scotland) Act came into force in April, which introduces a system by which action can be taken against high hedges which restrict daylight and amenity. Many councils have decided that its provisions will be administered by their planning department. Basically a high hedge is over 2 metres high and formed by a row of two or more trees or shrubs. It is only defined as a high hedge if someone complains about it and that claim is upheld by the council. Complainants have to demonstrate to the council that they have tried to reach a solution with the hedge owner by alternative means, such as by mediation. If that has failed they send a “High Hedges Notice” application to the Council with a fee – presently £450. The council notifies the hedge owner that a complaint has been made, and then an officer from the council will go out to the property to assess the hedge, and its impact on the light levels in the complainant’s property. If this determines that the hedge is “high”, the Council serves the notice which describes the actions required and contains a deadline. If this is not met, the council can do the work itself and recharge the hedge owner. The hedge does not have to be on an immediately adjoining property. There are appeal rights to the Scottish Ministers for both parties.
. .. .. Pay Day Lending and Betting Offices .. .. ..
…. .. and the Government also propose that the planning system can contribute to dealing with these problems! Betting shops be removed from Class 2 of the Use Classes Order, and be added to the list of “sui generis” uses which are not in any class. However the current Class 2 freedoms from planning control to change from use as a betting office to other uses would remain. Pay Day Lending is more difficult: it is harder to define, but presently comes under the general description of “financial services” as Class 2. The consultation suggest two options: one is making exclusions to the definition of financial services in Class 2 – making them sui generis, such as “Money Service Business”, “Pawn broking”, “Premises for buying goods from visiting members of the public”, “Financial lending other than by deposit takers”, and “Deposit takers”. Option 2 would be the reverse – being more specific about what financial services are within Class 2 and therefore free from planning control : the suggestions are “Accountancy services”, “Insurance Services”, “Deposit takers” – such as a bank, a building society, a credit union or a friendly society. Not only does this seem complex and open to interpretation, but could add to endless arguments where pay-day lending takes place within other premises such as a shop. 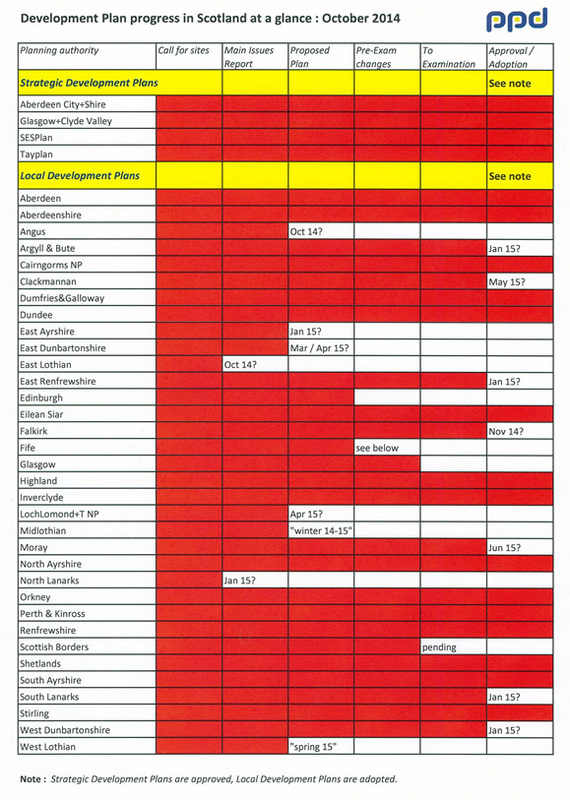 The planning officer dealing with an application will need guidance on what is an acceptable number of such facilities in an area, so there will need to be another new raft of planning policies on this subject. .. .. .. .. and hill tracks. “Prior notification” is a process that already exists in planning legislation and would be achieved by amendments to the General Permitted Development Order. The requirement for “prior notification” would apply throughout Scotland for any private way, but the emphasis will be on controlling tracks in areas where it is considered that additional protection of amenity, landscape or environment is required, while not imposing any significant additional burden on businesses in other areas.The Minister for Local Government and Planning has announced that “prior notification” will be required to planning authorities before “private ways” for agricultural or forestry uses are constructed (usually known as hill tracks). The planning authority can then consider whether or not prior approval is required for the siting, design or materials used for the track. Angus: the Proposed Plan was due this month, but suggestions are that it has been delayed into the new year. 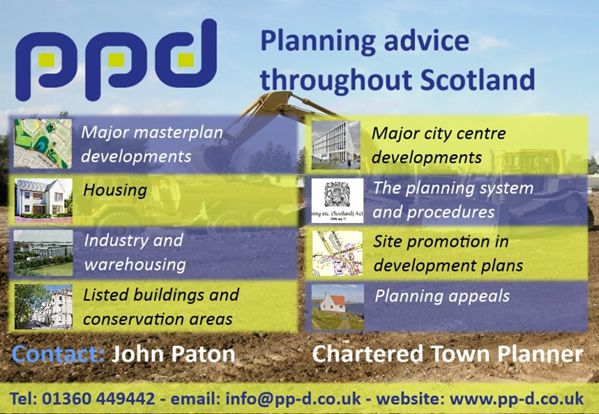 If you have development interests in Angus, keep an eye on the website or call us. East Lothian: expects to publish its Main Issues Report this month, with consultation starting in November. Fife: consultation on Proposed Plan starting this month. The plan can be viewed on the Council’s website. North Lanarkshire: Main Issues Report expected in new year. East Ayrshire: proposed plan expected early in the new year.